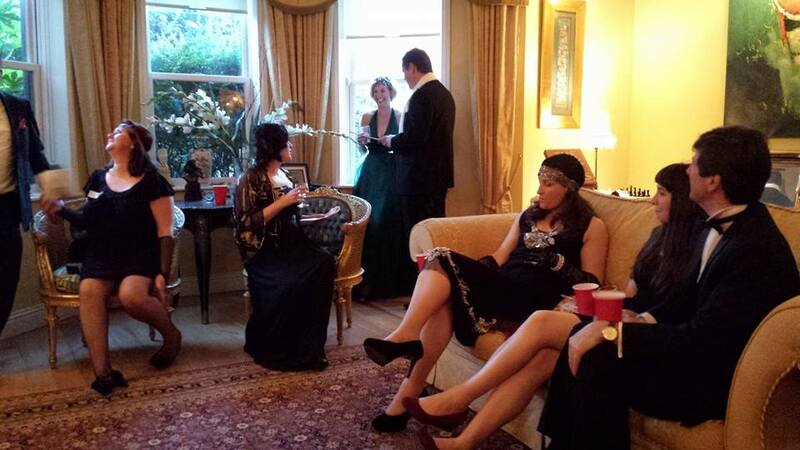 We are all fond of the familiar and like a routine, but why not entertain in style and do something a bit different by hosting a murder mystery party! With a little bit of time and money, you can hold a great night that people will be talking about for months after! Here are our top tips. This is one of the most important considerations. Pick a guest list of people you know will be able to enjoy being someone else for the night, and get into the spirit of things. Depending on your space, decide how many guests you are going to invite. If you’re going to cook dinner then perhaps 8 people is plenty, but if you just provide finger food your numbers can go higher. If you can, try and send out postal invitations. As Marshal McLuhan said the medium is the message, so by making that extra effort to post out invitations, people will take the whole evening more seriously. A week ahead of the planned murder, send out a paragraph of background information to set the scene and timing of the events, i.e. New Year’s Eve 1929 on the Orient Express, and a little bit about each character, so they can gather their paraphernalia and get into character. You can download many scripts online and print at home, with murders set in grand old houses, trains, even backstage on a Queen tour. Choose one according to your tastes and guest numbers. Take a look at our Etsy shop for scripts. After 90 minutes, people are looking forward to finishing, after two hours they’re fit to commit another murder if they can’t relax and finish up the game. If your mystery is in three parts, make each half an hour long and be strict about hurrying through the game. The theme from your script will help decide what the dress code should be. If it’s Murder on the Orient Express in the first class carriage – black tie is appropriate. If the murder is happening at Glastonbury – encourage festival gear. The idea of fancy dress may put some people off, but trust us, it helps everyone get into character. Let your theme guide your menu options. Smaller murder mysteries work well through a dinner party. Each course can start or end an act. For larger groups save yourself the hassle and whip up some big platters. Canapés for the Murder on the Orient Express included smoked salmon and cream cheese blinis, peach and roquefort nibbles, carrot and cucumber crudités with cheese and hummus dips, honey mustard-glazed cocktail sausages, salad, two whopping meat and cheeseboards. If you’re not using Spotify, get it downloaded. The service is available for free or paid customers and they create the easiest hassle-free playlists so you can just plug and go. For Murder on The Orient Express we used this playlist. I did not see a solution to the murder in the downloadable scrips. Thanks Missy – I will add that in. Hi Estie did you ever receive the scripts? Hi, this is an awesome blog post!! It has given me such great ideas for my Murder Mystery party 😀 I was wondering if I could get a copy of the solution for your scripts? Thank you! Hi Jenn did you ever receive the scripts? Hi! Just wondering if you did have the solution to the murders? I didn’t see it in any of the booklets! Hi Gill did you ever receive the scripts?